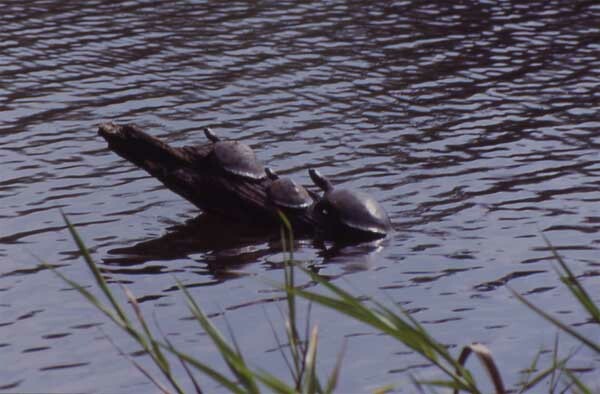 The Amazon's endless quiet streams and lakes are a haven for freshwater turtles. Here these harmless reptiles reach a diversity equal to anywhere else on earth. Turtles feed on a wide variety of invertebrates such as insects, worms and snails, and occasionally other animals such as frogs or small mammals. They are highly secretive and wary. Many visitors never see one, although they might hear a splash as a startled turtle slips into the water. The pictured species is most likely Podocnemis unifilis. 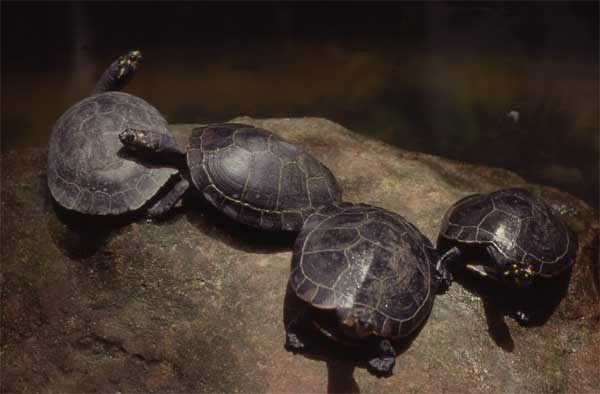 These, and most Amazon turtles, belong to the primitive "side-neck" group (Family Pelomedusidae), so-called because they retract the head sideways into the shell. Turtles, like all reptiles, bask in the sun to get energy to move around. Here, these three (probably Podocnemis sp.) have found a convenient branch protruding from the water. If they are disturbed they swiftly slip into the water with barely a sound.